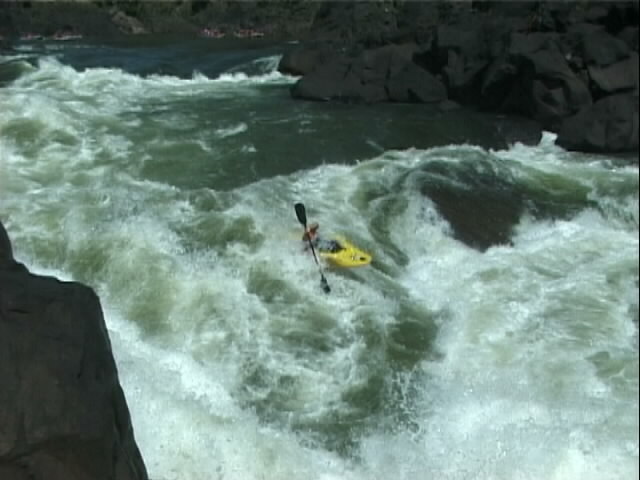 The Zambezi is a big volume run starting from imediately below Victoria Falls. Low water flows (July to January) are typically 150 cumecs minimum up to 1000 cumecs at low water close, highwater flows are 1000 to 5000 cumecs before highwater close. 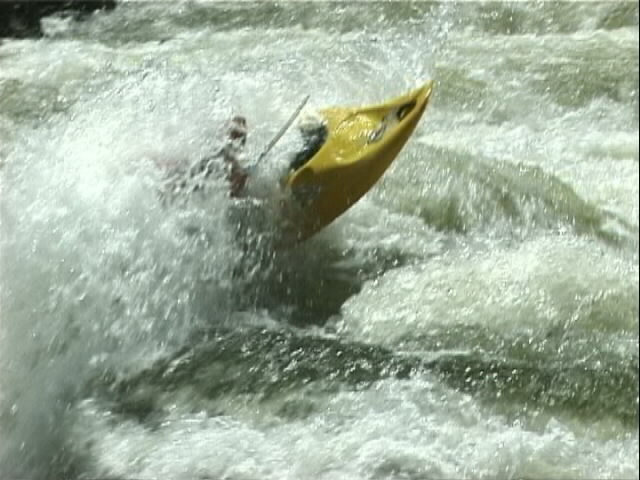 Highwater levels can get up to 15000 cumecs. The flow this October (approaching minimum) was something around 200 cumecs, similar to the Bio-Bio in January or high water on the Sjoa. This amount of water makes for very powerful, big rapids but the pool drop nature of the river makes everything pretty safe. 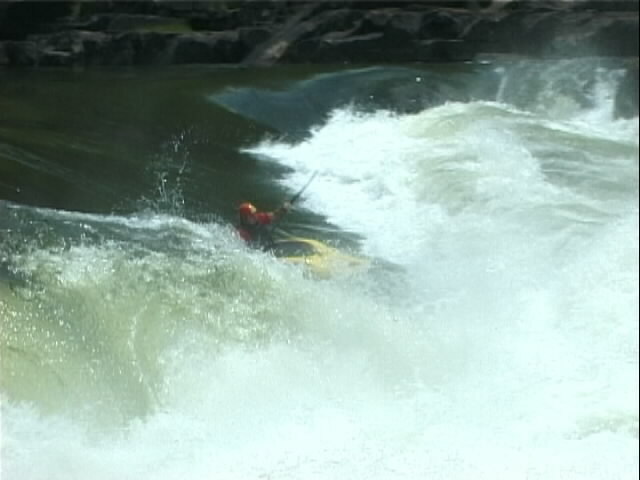 From the Zambian side, a days rafting (or kayaking) consists of 18 numbered rapids. From Zimbabwe you start with rapid number 4. 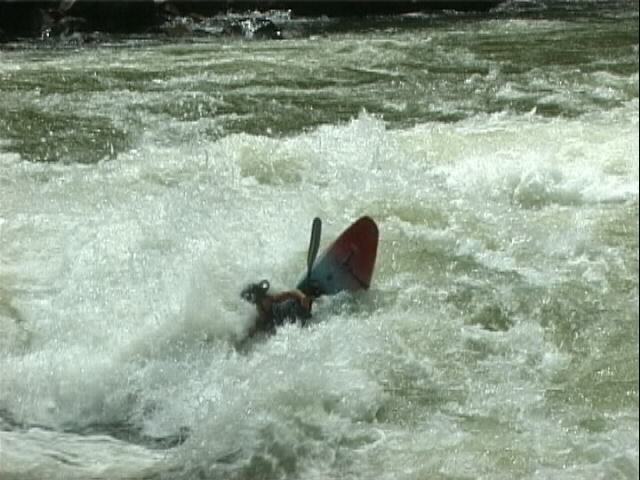 The first 3 rapids are III to III+ but serve as a good warm up, plus you get a spectacular view under the falls. Sobek and Safari Par Excellence are the main companies that operate from the Zambian side. 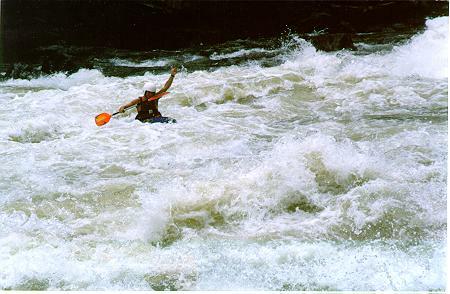 Unless you want to try the `minus' rapids (for which you have to walk upstream under the falls), the most difficult rapids start at 4, with 4, 5 and 6 all IV+. 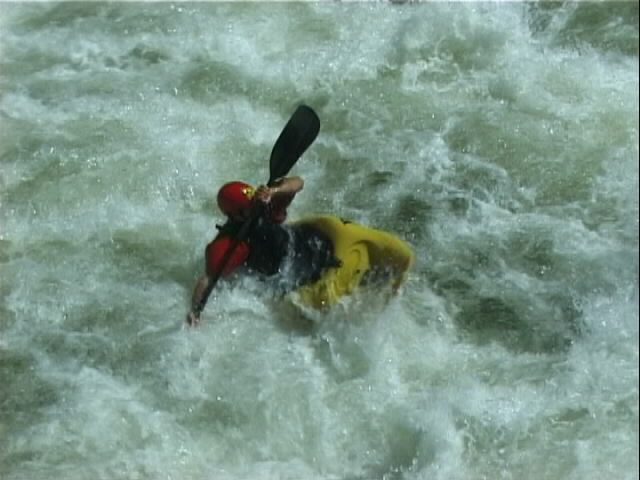 At around 600m number 7 is the longest rapid on this section and the difficult move at the top makes this the hardest of the rafted rapids. I'd give it a V because of this. Then 8 is again IV+ before you reach `Commercial Suicide', number 9. This is most definitely V+, with a difficult right to left cut across the top of a monster hole after you've almost certainly been trashed in the entry drop. 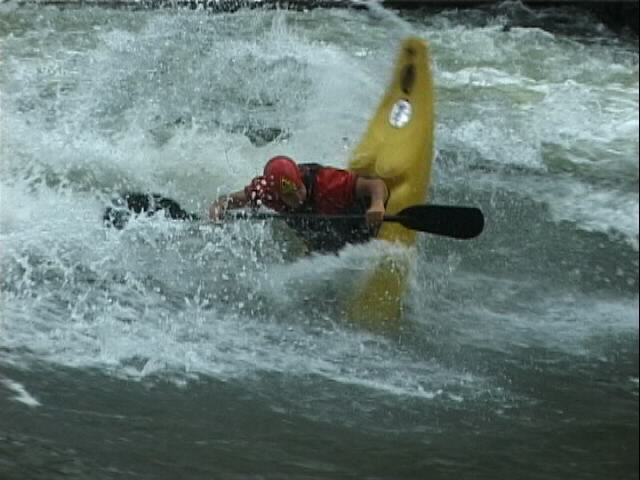 Luckily you can follow the rafts along an easy portage river right (at least at low water, at high water you have to run it). Number 10 is easy, hardly worth naming, before the rafts stop for lunch. After lunch, number 11 is again IV+, a good trashing could easily be taken in this one, but it is the last of the tricky rapids. The rest is grade IV with a couple of III's thrown in. 12b has a truly massive surf wave that has to be seen to be believed and the are a few easily visible holes to trap the unwary before number 18, where most of the rafts deliberately flip. 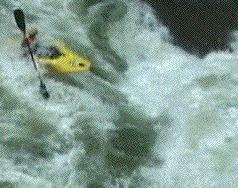 Kayakers can easily skirt the hole or drop in for a sound trashing. We flew charter (Caledonian Air) from London to Jo'burg for 300 pounds and then overlanded up to Victoria Falls via Bulawayo. This takes about 1.5 days, but better schedule at least 2. Transport cost around 40$US each way, we took a bus to Bulawayo and then an overnight train (very colonial) to Vic Falls. 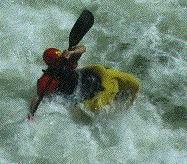 Costs in country are minimal, rafting will set you back around 95$US, it's about the same for kayaking.